KHYBER AGENCY, February 1, 2018: Hundreds of tribesmen and leaders of political parties on Thursday staged against the arrest of innocent tribesmen and rude behavior of Khyber Rifles'(FC) towards the loyal citizens of Landikotal in Khyber Agency, FRC learnt. 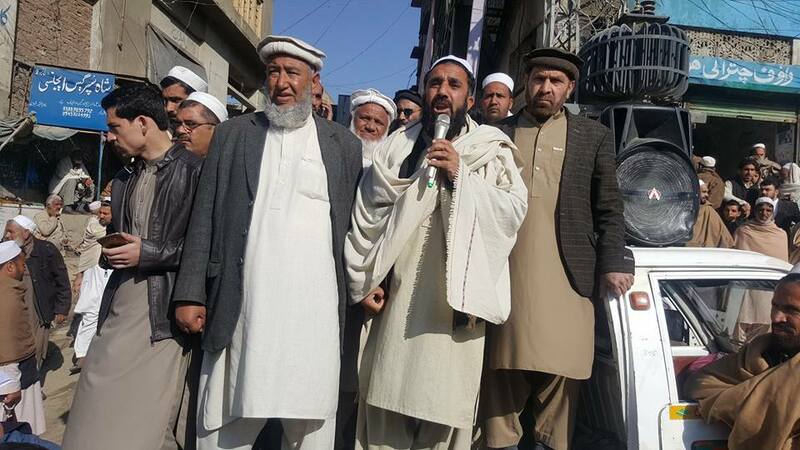 The protesters belonging to Landikotal, including businessmen, leaders of political parties and youths gathered at Bacha Khan Chowk in Landikotal bazaar and chanted slogans against Khyber Rifles’ officials. They were holding placards and black flags to record their protest against the misbehavior of the officials and the arrest of innocent and patriotic citizens of Landikotal. Speaking on the occasion, Naib Ameer of Jamat-i-Islami(JI), Zar Noor Afridi of Awami National Party (ANP) Khyber Agency, Shah Hussain Shinwari of Pakistan Tehreek-i-Insaaf, Abdur Raziq Shinwari and Zarqeeb Shinwari strongly criticized the insolent and rude behavior of Khyber Rifles'(FC) officials towards the innocent people of Landikotal. The speakers warned that the persistent misbehavior of FC personal towards tribesmen and the arrest of innocent and law abiding civilians without any reason will create hatred among ordinary masses towards security forces. “Few FC officials in Landikotal are spoiling the good image of security force. Their treatment with the innocent tribesmen is very humiliating and inhuman. They are snatching non-custom paid vehicles from poor people which they were using as taxi to earn bread and butter for their family”, said one of the speakers. They appealed to the chief of Army Staff, Qamar Javed Bajwa and Inspector General of Frontier Corps to take immediate notice of the situation in Landikotal. The speakers at the protest threatened that if their demands were not addressed they would block highway in Landikotal and will expand protest demonstrations countrywide.